"We are part of His divine purpose: 'My work and my glory,' He said, is 'to bring to pass the immortality and eternal life of man' (Moses 1:39). In order to achieve those objectives, 'God so loved the world, that he gave his only begotten Son, that whosoever believeth in him should not perish, but have everlasting life' (John 3:16). That act was a supernal manifestation of God’s love. 'For [He] sent not his Son into the world to condemn the world; but that the world through him might be saved' (John 3:17). "God is the same yesterday, today, and forever, but we are not. Each day, ours is the challenge to access the power of the Atonement so that we can truly change, become more Christlike, and qualify for the gift of exaltation and live eternally with God, Jesus Christ, and our families. For these powers, privileges, and gospel gifts, thanks be to God!" 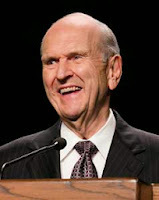 I love President Nelson's spirit of joyful gratitude. 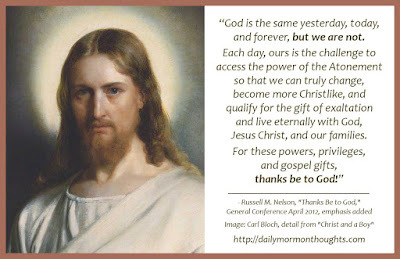 In acknowledging the "sublime message of Easter" and the supreme gifts given to us through the Atonement of the Savior, he reminds us first of the "supernal manifestation of God's love" on our behalf as He gave His Son to offer salvation, and the dual gifts of immortality and eternal life. As we "access the power of the Atonement" of Jesus Christ in our daily lives, we find the ability to change and grow, to "become more Christlike" and thus to receive the fullness of what He offers to us. As President Nelson says with rejoicing, "Thanks be to God" for these manifestations of His love for us, and for the joy and peace that comes to us as we fully accept His gifts!